Last Saturday night, the parking space I found was pretty close to the big fancy Shop-Rite supermarket in town. So I thought, hmmm, instead of getting a takeout chicken parm sub tonight, or ordering a pizza, or making due with the third-of-a-bag of Rold Gold thin pretzels in my apartment, I suppose I could purchase and heat up some sort of frozen item. And not some run-of-the-mill frozen item from the boring A&P near my place—an exciting big fancy Shop-Rite frozen item. Something I’ve never had before! And I had orange juice at home. This was going to be a gourmet meal! No Hot Pocket tonight, no sir! I walked up and down two-and-a-half long aisles of frozen delights. As I’ve stated before, I spend very little time in supermarkets, so every visit is a fun scavenger hunt. Everything’s new! It’s like that movie Memento if it were a comedy. 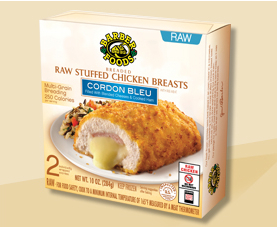 My eyes lit up at the sight of Barber Foods skinless breaded boneless chicken cordon bleu. “Quality since 1955,” the package said. “Half off!” the price tag chimed in. Time-tested, value-priced chicken, cheese, and ham? Count me in, brother! But first I decided to read the instructions. Ooh. Do not microwave. That’s a drag, but—not a deal-breaker. I do have a conventional oven, which I believe to be in working order. Bake for 28 minutes. Huh. That’s a long time. That’s a really long time. And very much at odds with my oft-stated philosophy: If it takes longer to prepare than to eat, screw it. And it was nearly 9 p.m. already. But…no, no, I could do this. I’ve got enough problems without giving myself a case of salmonella from half-price frozen chicken. I placed the package back on the freezer shelf. Which is also not a euphemism.